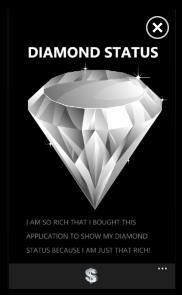 The I Am Rich application has reappeared on the recently launched Windows Phone 7, though it doesn't require as many riches as before. Back in late 2008, iPhone developer Armin Heinrich created a controversial application called I Am Rich and set it loose on the App Store. It cost $999.99, the maximum price allowed for an app, and was nothing more than a shimmering red jewel that you could show to others to brag about how rich you were. Apple removed it after 8 purchases (some accidental), but I Am Rich has triumphantly returned on another platform: Windows Phone 7. Microsoft launched Windows Phone 7 in November 2010 in an attempt to expand its presence in the mobile phone market. With I Am Rich now among the ranks of the Windows Phone Marketplace, the platform may have made inroads already. The Windows Phone 7 version of I Am Rich costs $499.99, 50% off of the original price, but only because that's the price ceiling for Microsoft's app store. It works in a very similar way to the previous version, though apparently comes from a different developer. The app's description says it's "meant only for those who are rich or anyone else who can afford excellence." I Am Rich now displays a shiny diamond instead of a red jewel, but still does nothing worth even close to 500 clams. This time, it at least allows users to display their status with text, such as: "I'm so rich that I just wasted $500 to prove it. Someone, please, love me." Microsoft hasn't put the kibosh on I Am Rich yet, but it was released over the holiday week so it might not have taken notice yet, or could leave it up for good. I'm not sure if the original I Am Rich actually broke any rules for an uploaded app, and the new version may not either. Quite honestly, owning it is a little sad, but if that's how you want to spend your money, feel free.